Originally launched back in 2007, Family Life was relaunched, with a new look, feel and tone in 2016. Family Life is a smart, glossy lifestyle title for adults living in Scotland. With family at its heart, the magazine covers everything that matters in modern life in Scotland, from finance to careers, fashion to food. Each issue is packed with celebrity interviews, mouth-watering recipes, real-life stories from inspirational Scots, topical issues that are making the headlines and advice and information on everything from money to retraining. Whether we’re looking into what life’s like for families in developing countries, finding out about starting your own business, looking at the latest interior design trends or offering up ideas to keep the kids occupied over the holidays, Family Life promises quality, thought-provoking and relevant editorial every issue. The 2018 incarnation of Family Life is taking on a slicker style, smarter tone and more grown-up feel to appeal to both men and women of all ages nationwide. 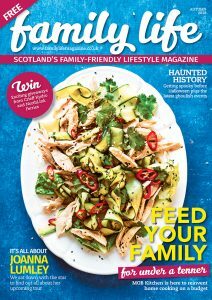 Published three times a year, the magazine is distributed through supermarkets, cafes, gyms, leisure centres, soft play areas and lots of other locations that play a part in the lives of families across Scotland.